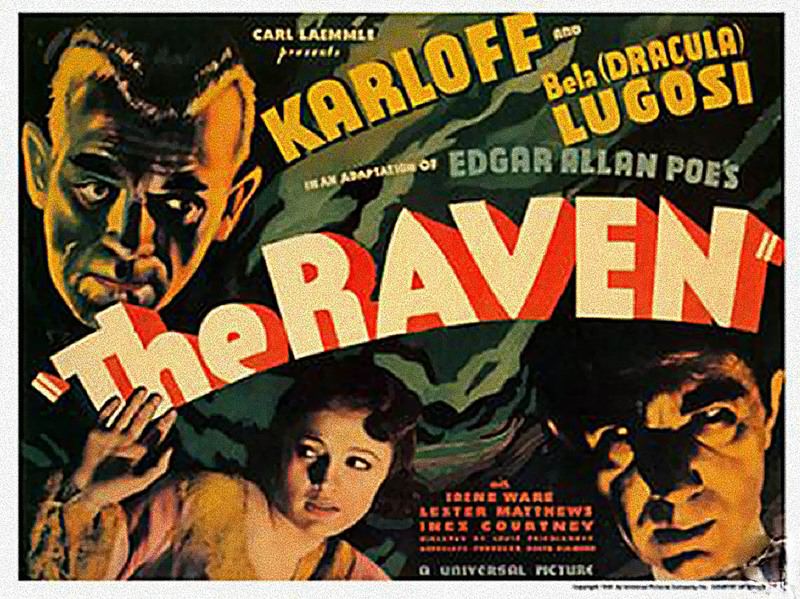 In 1935, the horror film continued its tentative cultivation of the literature of Edgar Allen Poe with Universal’s The Raven. The association with Poe’s densely atmospheric source material would later flower into vibrant colour in the 1960s through Roger Corman’s collaborations with Vincent Price, but in this period the writer’s poems and short stories would be an inspirational springboard for Hollywood studios with little attention paid to faithfulness to the source material. That said, in the case of this film, the central character is a deviant in thrall to his perceived idea of Poe the artist as a role model. The raven exists as a shorthand symbol for death with a couple of extended quotes from the titular poem’s haunting musicality at points to suggest looming mortality. 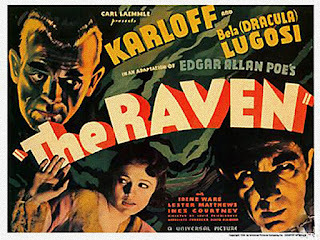 Directed by Lew Landers from a script credited to David Boehm but laboured over by eight writers, The Raven was a re-teaming of three Universal ‘properties’ in the forms of the writer along with stars Boris Karloff (given top billing here and by his now-trademark surname only) and Bela Lugosi after they were combined in The Black Cat (1934 – see my review dated 16/5). Though billed second and accepting half the fee given to Karloff, the persistent rumours of jealous hostility from Lugosi still seem not to be borne out by accounts from both actors’ families in later interviews. Lugosi was still the subject of some 200 reported fan letters a day from the ladies, the Washington Post claiming he was the reason also for a deluge of actresses wanting to play the female roles in the film. He also joined with Karloff in recruiting new members to the fledgling Screen Actors Guild. Karloff apparently was less than happy with the script and Universal at this point, but was careful to be a thorough gentleman with the cast and crew. The parts and the script make better use of the chemistry developed between the studio’s men of horror in a spirited and fun vehicle for their talents, although somewhat ruinously controversial for its relish of torture which seems to have played into Britain’s temporary ban on horror films for a while afterwards. Lugosi channels his familiar aristocratic grandeur well as Dr Richard Vollin, a celebrated surgeon tempted by an appeal to his ego to come out of retirement in order to operate on Jean, the car-crash victim daughter of Judge Thatcher - (Samuel S Hinds, notable player for Frank Capra as Peter Bailey in It’s a Wonderful Life). Vollin is introduced as a devotee of Poe straight away by virtue of a silhouette of the symbolic bird, his talisman, as he intones part of the poem. Such is the renown for Vollin’s Poe collection that a museum representative is prepared to pay handsomely for it. “Death is my talisman – the one indestructible force” he muses, an obsession frequently embodied in the actor’s roles that will pervade the rest of the film. Lugosi becomes partner-in-crime with Karloff when his successful operation leads to an all-consuming desire for Jean (Ex Miss America Irene Ware) thwarted by her father. Jean is something of a tease, dancing a special Raven-themed performance in the theatre to show her appreciation, yet seemingly blithe to the flames of passion lit within Vollin while she has Lester Matthews as her bland but loyal fiancé Jerry. When the judge visits Vollin to persuade him to stay away from her, Vollin’s possessive ego seethes: “Send her to me. I warn you…” Karloff as San Quentin escapee Edmond Bateman comes to Vollin for plastic surgery help with his ‘ugliness’, voicing the theme of outward unsightly appearance manifesting inner evil much as how Richard of Gloucester would justify his murderous swathe of ambition in Richard III. Here, Karloff earns our immediate sympathy in a different way to Shakespeare’s villain with his characteristic lugubrious sensitivity, an impressive quality even allowing for Bateman’s criminal past as a bank robber who acetylene-torched a teller’s face - “Sometimes you just can’t help…things like that” he remarks furtively. 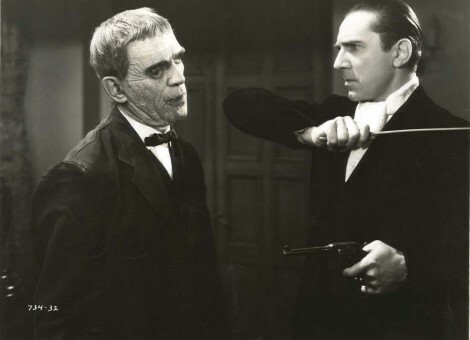 A great dynamic is set off between Karloff and Lugosi, sparking off their natural respective high and lower status against each other. Vollin tricks Bateman into an operation that, instead of improving his looks, truly disfigures him with facial scarring and a lop-sided mouth to his face’s screen left side, and what looks like a left eye unsettlingly painted on to the eyelid by make-up master Jack Pierce for a glassy, uneasy stare. Bateman is reduced to an impotent, fist-shaking ’Urgghh’ that recalls his Frankenstein monster’s heart-rending suffering. The Hungarian’s imperiousness dominates the Englishman’s tall yet bowed meekness while both boil with suppressed feeling - Vollin for revenge and entitlement to own Jean as his ‘Lenore’ (Jean as imprinted version of the narrator’s beloved in the poem) and Karloff tormented by the conflict between his conscience and fulfilling Vollin’s grisly plot. Vollin sends out party invites to Thatcher, Jean, Jerry and others on a pretext to bring Jean to his home. Clearly, he has murder and Poe-influenced torture on his mind, showing the appalled Bateman his impressive dungeon of sadistic devices influenced by the writer including a bench with a swinging axe overhead (later indelibly portrayed in Corman’s take on The Pit and the Pendulum). Bateman’s disgust is such that he traps Vollin on the bench but in vain; Vollin’s blackmail hangs over him more portentously than the blade. The scene is set for what would be an ordinary third act re-run of The Old Dark House plotting were it not for the pace being nicely ratcheted up by Vollin’s gadgetry extending to Jean’s room being built as a giant descending elevator to his lair and a room with inward-closing walls. Lugosi savours the forthcoming murder of them all (Thatcher strapped under the pendulum axe) with a marvellous Cheshire Cat grin: “I like torture…” The principal cast of innocents are all placed in Republic serial-style peril intercut with Bateman eventually succumbing to his good nature to free them, earning a bullet from Vollin for his sabotage yet with enough mortal energy left to dispatch Lugosi into his own pressing engagement before they both die. 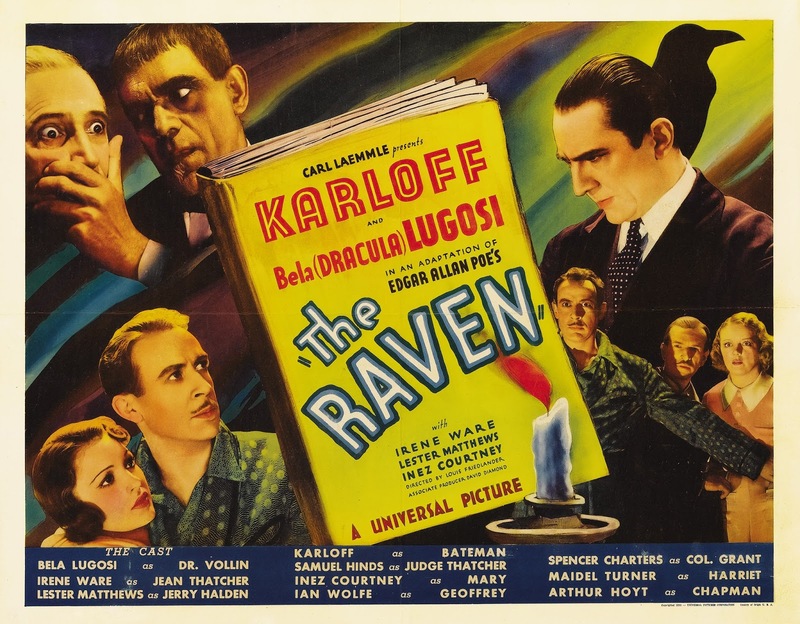 Whilst The Raven was filmed in only a little more than two weeks, it holds up surprisingly well, principally due to Karloff and Lugosi’s byplay. Inevitably, their chemistry as studio horror figureheads was still to be exploited in future releases. 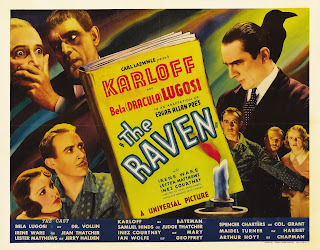 In 1963 Roger Corman would rework The Raven idea as an unconnected comedy casting Karloff again and having him share the film's dark humour with Peter Lorre and Vincent Price.